Knowledge workers are specific group of employee. They are independent knowledge producers for whom knowledge is the primary tool and resource for their work, as was stressed by Mladkova et al. (2015). Modern networked organizations that want to be innovative and create market advantage must find a way to harness this resource, which is not in their possession. This situation has completely changed the role of knowledge workers. They become precious for organizations. As independent knowledge producers, they can distribute the value that they generate in an already existing network, or they can build a network themselves. This group drives companies’ current and future performance; therefore, it is worthwhile determining which cultural dimensions have a strong influence on their performance. Liu et al. (2018) found that national culture predominates in how knowledge is being managed in China. European organizations are more international. National cultures’ and organizational cultures’ influences are visible. It is worth examining how Hofstede’s national cultural dimensions influence knowledge sharing and job satisfaction from the individual knowledge worker’s point of view. Therfore, this article aims to examine how job satisfaction influences the relationship between company performance, knowledge sharing, and organizational culture, perceived through the prism of Hofstede’s dimensions. Yoo et al. (2011) applied Hofstede’s national culture concept at the individual level. Clarifying the aim of the current study, it is interesting to identify how these dimensions influence knowledge sharing and job satisfaction from knowledge workers’ perspective. Thus, bearing in mind all of the above, this article aims to explore the impact of different dimensions of organizational culture on knowledge sharing and organizational performance, including job satisfaction. Several studies have suggested that organizational culture positively determines knowledge sharing. However, further empirical research devoted to the links between job satisfaction, organizational culture, and knowledge sharing is still necessary. Expected results of empirical research based on the case of Polish enterprises can enrich the existing recognition of knowledge sharing and its key determinants, such as organizational culture and job satisfaction. The conclusions may both inspire future research and be useful for practitioners. The paper proceeds as follows. First, the literature review establishes the hypotheses and develops the theoretical model. Second, the method used to empirically verify that the proposed model is presented. Next, the research results are presented and discussed. Finally, limitations and implications precede the conclusion of the full study. The concept of organizational culture has been widely discussed by various scholars, who have analyzed this phenomenon through the prism of different perspectives, for example, barriers to knowledge management (De Long and Fahrey, 2000) and employees’ willingness to share knowledge (Mc Manus et al., 2016). The concept of organizational culture usually refers to the organizational structure in which are embedded values, beliefs, and assumptions that serve as a guide for its members. Each organization is characterized by a specific culture (in this study we treat “organizational” and “company’s” culture as the same). Some cultures contribute to the effective functioning of companies while others hamper their effectiveness. It is generally acknowledged that organizational culture is an essential factor of organizational performance and a source of sustainable competitive advantage under the conditions of the contemporary economy (Lee and Gaur, 2013; Idris et al., 2015). In a suitably shaped organizational culture, the members of a given organization can work in harmony with others to achieve some shared goals. Moreover, organizational culture is more often regarded as one of the basic prerequisites for the generation of innovation, which is perceived as a social process (Büschgens et al., 2013; Lin et al., 2013). It may encourage knowledge sharing and learning, which are decisive for innovation. For instance, such behaviors as knowledge hoarding, apprehension about failures, and the “not-invented-here” syndrome are hostile to knowledge sharing. In turn, incentives related to knowledge management efforts are crucial in creating a knowledge-sharing culture (Sundaresan and Zhang, 2013). At the organizational level, organizational culture identified with certain assumptions, values, and norms of behavior can be decisive for knowledge-sharing practices (Tong et al., 2014). According to Schein (1986), culture is like a pattern of basic assumptions that are invented, discovered, or developed by a given group as it learns to cope with problems of external adaptation and internal integration. Both axiological and behavioral dimensions of organizational culture affect knowledge sharing considerably. Taking this into account, examining the influence of different dimensions of organizational culture on knowledge sharing is an interesting research challenge. At the individual level, in turn, one of the most important factors is job satisfaction, defined as the extent to which people like or dislike their job (Davis, 1988). Psychological, physical, and social well-being in relation to job satisfaction influences attitudes, behavior, and motivation (Kianto et al., 2016). Moreover, motivation is closely linked to the process of knowledge sharing that arises in the culture based on trust and collaboration. Company culture, also known as organizational culture, is an important issue in theory and practice. Various definitions of organizational culture have been proposed by researchers over the years. For example, Schein (1986) perceived culture as a pattern of basic assumptions that are invented, discovered, or developed by a given group as it learns to cope with its problems of external adaptation and internal integration. According to Hofstede et al. (2010), organizational culture is collective mind programming that helps to distinguish members of one organization from another. Mc Manus et al. (2016) described company culture as the norms, beliefs, values, and practices adhered to by organizational members to sustain and develop a firm’s goals without adversely affecting the welfare of the organization or its members, and within this culture, subcultures can develop. According to Frost’s (1985, p. 17) definition, “talking about company culture seems to mean talking about the importance for people of symbolism, rituals, myths, stories and legends and about interpretations of events, ideas, and experiences that are influenced and shaped by the groups within which they live.” This suggests that national culture influences company culture (Hofstede, 1980; Alvesson, 2012). Many researchers have claimed that organizational culture has an impact on knowledge sharing (Hofstede, 2001; Ford and Chan, 2003; Lai and Lee, 2007; Lin and Dalkir, 2010; Ling-Hsing Chang and Lin, 2015). A suitable climate for knowledge sharing is found particularly in a collaborative culture that promotes patterns of interaction and communication that foster employees’ learning and creativity (Pinjani and Palvia, 2013). According to Kathiravelu et al. (2014), the company culture affects the knowledge-sharing process. The significant influence of a collaborative culture on knowledge sharing has also been pointed out by Mueller (2014, 2018) and Arpaci and Baloglu (2016). The influence of a collaborative culture on knowledge sharing has also been indicated by Mueller (2014), Al Saifi (2015), and Arpaci and Baloglu (2016). A majority of studies have revealed that organizations based on values such as trust, cooperation, open communication, and diversity that are characteristic of a collaborative culture, gain a competitive advantage and superior performance. Based on all above the hypothesis has been developed as follows: H1 Company culture has a positive influence on knowledge sharing. Job satisfaction has also been the subject of study by researchers from different fields, mainly management, business, and psychology. This concept refers to a positive emotional state resulting from an employee’s appraisal of his or her job (Locke, 1976; Spector, 1997; Springer, 2001; Suliman and Al-Hosani, 2014; Saeed, 2016). Boles et al. (2009) claimed that job satisfaction depends on all the characteristics of a job and the work environment, such as career development opportunities, rewards system, employee relationships with management, job security, and conditions for employee engagement. A pleasurable state of mind and positive emotional status resulting from well-being at work is determined to a great extent by human resources management practices, which are one of the elements of organizational culture. Empirical research (Lok and Crawford, 2001; Lund, 2003; Warr, 2007; Habib et al., 2014; Al-Sada et al., 2017) has proved the relationship between organizational culture and job satisfaction. In addition, job satisfaction plays a role of intrinsic motivation in the process of knowledge sharing. Employees are willing to share knowledge with the organization only if they are satisfied with their job. According, the following hypothesis was developed: H2 Company culture has a positive influence on job satisfaction. Bearing in mind both of the hypotheses developed above to better understand the company culture influence on job satisfaction, the most exhaustive company culture model must be investigated. At least a few models of organizational culture can be found in the literature, such as those of Hofstede (1980), Trompenaars and Hampden-Turner (2002) and House et al. (2004). These authors identified different measurements of organizational culture. For example, Hofstede (1980) proposed a five-dimensional measurement of organizational culture, which is used as a set of variables: power distance, uncertainty avoidance, individualism/collectivism, masculinity, and long-term orientation. Eskildsen et al. (2010) confirmed the significance of Hofstede’s cultural dimensions in job satisfaction studies. Based on this, both of the above hypotheses were developed further. Power distance The first dimension of power distance is defined as “the extent to which the less powerful members of institutions and organizations expect and accept that power is distributed unequally.” People in some cultures accept a higher degree of unequally distributed power than do people in other cultures. Social hierarchy is a part of their culture. Leaders are therefore expected to resolve serious problems and make the difficult decisions. Inferiors avoid conflicts with their bosses. In contrast, in lower power distance cultures there is a preference for consultation, and subordinates will quite readily approach and contradict their bosses. Al Saifi (2015) suggested that organizational culture, in general, has the most critical input into all knowledge management initiatives, an important component of which is knowledge sharing. It is also claimed that organizational culture can have a positive impact on whether employees are willing to share their knowledge regardless of the directives coming from senior management (Suppiah and Sandhu, 2011). What is more, the gap between superiors and employees in a high power distance culture discourages knowledge sharing (Davenport and Prusak, 1998; Hofstede, 2001; Ajmal et al., 2010). Moreover, Boles et al. (2009) suggested that weak employee relationships with management decrease job satisfaction. Based on all above the hypotheses have been developed as follows: H1a: A high power distance culture based on a high degree of hierarchy and vertical distance among managerial levels has a negative impact on knowledge sharing. H2a: A high power distance culture based on hierarchy and inequalities has a negative impact on job satisfaction. Uncertainty avoidance The second company cultural dimension, according to Hofstede (1980), is uncertainty avoidance, which is defined as “the extent to which the members of a culture feel threatened by the uncertain or unknown situation.” Cultures whose members are not keen on uncertainty plan everything carefully in an attempt to avoid the uncertainty. Cultures with a relatively high level of uncertainty avoidance support the process of knowledge sharing through the established norms and practices. When the work environment is dominated by rules, procedures, or a distributed control system, employees feel more comfortable and safe (Hofstede, 2001; Wilkesmann et al., 2009; Blomkvist, 2012). A more predictable environment encourages knowledge sharing and increases job satisfaction. All the above lead the following hypotheses formulation: H1b: A high uncertainty avoidance culture supported by norms and practices has a positive impact on knowledge sharing. H2b: A high uncertainty avoidance culture supported by established norms and practices has a positive impact on job satisfaction. Collectivism/individualism The third dimension is individualism, which according to Hofstede refer to societies in which bonds between members are loose: everyone is expected to take care for himself or herself or his or her family. Conversely, collectivism means that people identify with groups and are willing to work as a team, which protects them in exchange for loyalty and compliance. In a collectivistic culture, employees are more determined to achieve group goals and this has a positive impact on knowledge sharing (Thongprasert and Cross, 2008; Pangil and Moi Chan, 2014). Ma et al. (2014) proved that in collectivist cultures, individuals with high altruism are more likely to share their knowledge with workmates. Kirkman and Shapiro (2001) stressed that a higher level of collectivism is associated with a higher level of job satisfaction. Based on that the following hypotheses have been developed: H1c: A collectivist culture based on teamwork and employees’ commitment has a positive impact on knowledge sharing. H2c: A collectivistic culture based on teamwork and employees’ commitment has a positive impact on job satisfaction. This study examines mainly knowledge workers, arguing that their level of knowledge sharing is much higher than that of other types of workers. To fully understand staff perceptions, it was important to include “position” as a CV in the study. 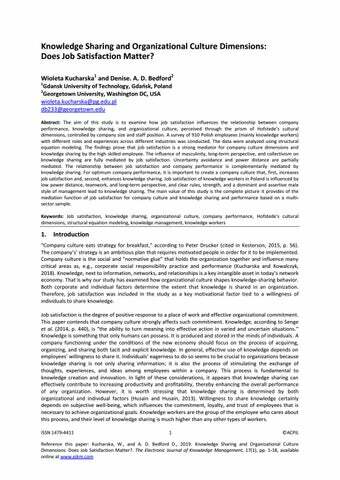 Kucharska and Wildowicz-Giegiel (2017) examined the influence of Hofstede’s company cultural dimensions on knowledge-sharing intentions. They observed that employee “position” significantly influences the whole model. Therefore, “staff position” was included as a variable in the theoretical model. It is assumed that workers with higher positions, recognized as “knowledge workers,” care more about job satisfaction and knowledge sharing than serial employees do. Figure 1 presents the theoretical model and the assumed hypotheses. Figure 1: Theoretical model. Source: Authors’ study based on Hofstede (1980), Rikowski (2007), Yoo et al. (2011), Tong et al. (2014) , and Rezaei et al. (2016). The model’s estimation then proceeded through the maximum-likelihood method. Evaluation of the measurement model quality was conducted using a set of tests, including the root mean square error of approximation (RMSEA) (Stieger and Lind, 1980; Byrne, 2016), using the reference value ≤ 0.08; minimum discrepancy, divided by its degrees of freedom (CMIN/DF) (Wheaton, 1977), using the reference value ≤ 5; and the comparative fit index (CFI) (McDonald and Marsh, 1990), using the reference value close to 1 with SPSS AMOS 25 software. Table 2 presents the results of the goodness of fit tests for both models: MODEL A without CVs, and MODEL B with CVs, following Aguinis and Vandenberg (2014). In the two cases, the general results were similar, but Model A fit the data better. Including CVs generally reduces the degree of freedom and statistical power (Carlson and Wu, 2012). Based on these results, both models were considered a good fit in relation to the data. A model reliability level of 3.95 and 4.3 can be viewed as positive, using the reference value ≤ 5. Based on the approximation average error RMSEA, the model fit the data at 0.057 and 0.6 and also met the reference values. Measurements of the goodness of fit were close to 1, which confirmed that the model was of the expected quality. The results of both models are presented and discussed (Becker et al., 2016) to explain how company size and employee position influence knowledge sharing and job satisfaction. With respect to the company’s five cultural dimensions, it was found that power distance and uncertainty avoidance are crucial for knowledge sharing from the employee point of view. Masculinity, collectivism, and long-term orientation have no significant influence on knowledge sharing, whereas all cultural dimensions significantly influence job satisfaction. Figure 2 is a graphical representation of the achieved results. Table 2 includes the hypotheses verification. Masculinity culture identified with competitiveness and assertiveness has a negative impact on knowledge sharing. High power distance culture based on a high degree of hierarchy and vertical distance among managerial levels has a negative impact on knowledge sharing. High uncertainty avoidance culture supported by norms and procedures has a positive impact on knowledge sharing. Long-term orientation culture directed towards future goals has a positive impact on knowledge sharing. A collectivistic culture based on teamwork and employees’ commitment has a positive impact on knowledge sharing. Masculinity culture characterized by the focus on personal success has a positive impact on job satisfaction. High power distance culture based on hierarchy and inequalities has a negative impact on job satisfaction. High uncertainty avoidance culture has a positive impact on job satisfaction. Long-term orientation culture directed towards future goals has a positive impact on job satisfaction. A collectivistic culture based on teamwork and employees’ commitment has a positive impact on job satisfaction. A high level of job satisfaction has a positive impact on knowledge sharing. Knowledge sharing has a positive impact on organizational performance. Job satisfaction has a positive impact on organizational performance. In light of the achieved summary, two important things needed to be investigated in more depth. First, the mediated effect of job satisfaction between company culture and knowledge sharing had to be verified. Second, the CVs’ significant influence on job satisfaction and knowledge sharing had to be developed. Table 3 presents the mediation analysis, and Figures 3-5 show the descriptive statistics for job satisfaction and knowledge sharing and CVs. Because of the different frequency of company size and staff position in the sample, the median was used for clear visualization. Bearing in mind the findings presented in Table 3, the mediation function of job satisfaction between company culture and knowledge sharing has been proved. The developed descriptive statistics suggest that job satisfaction and knowledge sharing are perceived more in mid-size and large companies than in small and micro firms. What is more, they seem to be correlated, which confirms Rafique and Mahmood’s (2018) systematic literature review conclusion. Figure 3: Job satisfaction and company size. Figure 4: Knowledge sharing and company size. Figure 5: Knowledge sharing and staff position. The presented results (Table 2) start from two models, MODEL A without CVs and MODEL B with CVs, following the comparison of Aguinis and Vandenberg (2014). In the two cases, the general hypothesis verification and presented mediation were similar, but Model A fit the data better, which was a result of the general reduction of degrees of freedom and statistical power by the CVs’ imputation (Carlson and Wu, 2012). The CVs’ imputation (Figure 3 and 4) not only enabled confirmation of the theoretical investigation conclusion about the correlation of job satisfaction and knowledge sharing of Rafique and Mahmood (2018), but also highlighted that job satisfaction supports the willingness of knowledge workers to share their knowledge. Calvo-Mora et al. (2016) hypothesized that knowledge management has a stronger positive moderated effect on key business results for small and medium-sized enterprises than it does for large companies, but their findings were not confirmed. The present findings are based on company size imputation as CVs on knowledge workers’ perceptions of knowledge sharing. It is worth highlighting that the present study is based on 910 cases (Poland) but Calvo-Mora et al.’s (2016) Spanish sample was smaller (225). It may be that the sample size of 910 cases (Poland) enabled observation of even more sensitive relations. The company size influence on knowledge sharing is significant at the p<0.05 level. Zieba et al.’s (2016) qualitative survey confirmed that the knowledge management approach adopted by small companies can be described as emergent in Poland. Kucharska et al.’s (2018) suggestions about the mediation function of job satisfaction for the relationship between company culture and knowledge sharing have been confirmed. Table 3 presents all the details of all identified mediations. The findings prove that job satisfaction is a strong mediator for knowledge sharing influenced by company culture, and both significantly influence company performance. The influences of masculinity, long-term perspective, and collectivism on knowledge sharing are fully mediated by job satisfaction. Uncertainty avoidance and power distance are partially mediated. What is more, knowledge sharing mediates between job satisfaction and company performance. These mediations enable presentation of the full picture of job satisfaction and knowledge sharing, company culture, and the performance structure of relations. With respect to the hypotheses verification, first, the analysis revealed that only two of the five cultural dimensions, power distance, and uncertainty avoidance, are significant for knowledge sharing. High power distance, based mainly on formal relationships between the management and employees, impedes knowledge sharing and a hierarchical structure contributes to social inequality at work, increasing the level of job dissatisfaction. The presented findings confirm that a high power distance culture discourages knowledge sharing (Davenport and Prusak, 1998; Hofstede, 2001; Ajmal et al., 2010). In turn, when the work environment is dominated by rules, procedures, or a distributed control system, employees feel more comfortable and safe (Hofstede, 2001; Wilkesmann et al., 2009; Blomkvist, 2012), which is also confirmed by the Hypothesis 1–2b verification presented in Table 2. Reducing uncertainty through formalization and standardization increases job satisfaction. Secondly, the result of the study showed that a collectivist culture characterized by individuals’ strong identification with the group along with their high propensity to cooperate does not encourage knowledge sharing, although its impact on job satisfaction is significant from the employee perspective, as was claimed by Kirkman and Shapiro (2001). These findings about the lack of teamwork influence on knowledge sharing were unexpected. Ma et al. (2014) also proved that in collectivistic cultures individuals with high altruism are more likely to share their knowledge with workmates, but their model did not include job satisfaction. The same situation observed for hypotheses concerning the impact of masculinity and time orientation on knowledge sharing was negatively verified, although its impact on job satisfaction was positive and significant from the employee perspective. The structure of teamwork and knowledge-sharing relations is different when job satisfaction is included as the mediator. This means that the mediation function of job satisfaction for knowledge sharing and company performance from knowledge workers’ perspective is significant. This article highlights the value of job satisfaction for the knowledge-sharing processes of knowledge workers. The significant influence of company size and staff position on knowledge sharing leads to a question about the industries’ and sections’ influences on these processes. This is an interesting subject of further research. The main limitation of this study was the non-random sample. Respondents participated in the survey voluntarily with self-report questionnaires, and it is possible that even if they were working in the same company since their opinions were subjective, those opinions might not reflect the company’s particular situation or even the situation in Poland. However, this is a common risk in all social science research (Babbie, 2013), and significantly, a normality-assessed sample helps to minimize the risk of wrong conclusions. To achieve the study’s aim and present the employees’ perspective, it was crucial to attract construction industry employees working in different positions. The convenience sampling method helped achieve a large enough sample of employees holding various positions working in companies of various sizes. The positive assessment of the sample normality (multivariate kurtosis = 608.13; cr = 216.32) justified the sample quality. The aim of the study was to examine how job satisfaction influences the relationship between company performance, knowledge sharing, and organizational culture, perceived through the prism of Hofstede’s cultural dimensions, controlled by company size and staff position. In light of the presented findings, it can be assumed that job satisfaction and knowledge sharing are more visible between managers in larger companies. Bearing in mind the full mediation analysis, it can be concluded that the mediation function of job satisfaction between the company culture and knowledge sharing is significant, whereas knowledge sharing mediates between job satisfaction and company performance. As shown in the illustration in Figure 5 of position influence on willingness to share knowledge, where it is evident that knowledge workers are more engaged in knowledge-sharing processes than serial workers, job satisfaction significantly increases the willingness of highly skilled employees to share knowledge. For optimum company performance, it is important to create a company culture that, first, increases job satisfaction and, second, enhances knowledge sharing. The main value of this study is the complete picture it provides of the mediation function of job satisfaction for knowledge sharing and company performance from the knowledge worker’s perspective, which emphasizes the importance of low power distance and clear work rules for job satisfaction and knowledge sharing. References Aguinis, H. & Vandenberg, R.J. 2014. An Ounce of Prevention Is Worth a Pound of Cure: Improving Research Quality Before Data Collection. Annual Review of Organizational Psychology and Organizational Behavior, 1, pp. 569-595. Ajmal, M., Helo, P. & Kekȁle, T. 2010. Critical factors for knowledge management in project business. Journal of Knowledge Management, 14, pp. 156-168. Al Saifi, S.A. 2015. Positioning organisational culture in knowledge management research, Journal of Knowledge Management, 19(2), pp. 164–189. Al-Sada, M., Al-Esmael & Faisal, M.N. 2017, Influence of organizational culture and leadership style on employee satisfaction, commitment and motivation in the educational sector in Qatar. EuroMed Journal of Business, 12(2), pp. 163-188. Alvesson, M. 2012. Understanding organizational culture, Sage. Arditi, D., Nayak, S. & Damci, A. 2017. Effect of organizational culture on delay in construction. International Journal of Project Management, 35(2), pp. 136-147. Arpaci, I. and Baloğlu, M. 2016. The impact of cultural collectivism on knowledge sharing among information technology majoring undergraduates”. Computers in Human Behaviour, 56, pp. 65-71. Asrar-ul-Haq, M. & Anwar, S. 2016, A systematic review of knowledge management and knowledge sharing: Trends, issues, and challenges. Cogent Business & Management, 3(1), 1127744. Babbie, E. 2015, The Practice of Social Research, Wadsworth Cengage Learning. Bagozzi, R.P. & Yi, Y. 1988, On the evaluation of structural equation models. Journal of the Academy of Marketing Science, 16(1), pp. 74-94. Bakotić, D. 2016. Relationship between job satisfaction and organisational performance. Economic Research-Ekonomska Istraživanja, 29(1), pp. 118-130. Becker, T.E., Atnic, G., Breaugh, J.A., Carlson, K.D., Edwards, J. R. & Spector, P.E. 2016. Statistical control in correlational studies: 10 essential recommendations for organizational researchers. Journal of Organizational Behavior, 37, pp. 157–167. Blomkvist, K. 2012. Knowledge management in MNCs: The importance of subsidiary transfer performance. Journal of Knowledge Management, 16, pp. 904-918. Boles, J., Hamwi, G.A., Madupalli, R., Rutherford, B. & Rutherford, L. 2009. The role of the seven dimensions of job satisfaction in salesperson’s attitudes and behaviors. Journal of Business Research, 62, pp. 1146-1151. Bontis, N., Richards, D. & Serenko, A. 2011. Improving service delivery: investigating the role of information sharing, job characteristics, and employee satisfaction, The Learning Organization, 18(3), pp. 239-250. Borgatti, S.P. & Cross, R. 2003. A relational view of information seeking and learning in social networks. Management Science, 49, pp. 432-445. Büschgens, T., Bausch, A. & Balkin, D. 2013. Organizational culture and innovation: A meta-analytic review. Journal of Product Innovation Management, 30(4), pp. 1-19. Byrne, B.M. 2016. Structural Equation Modeling with Amos, Routlege. Calvo-Mora, A., Navarro-García, A. & Periañez-Cristobal, R. 2015. Project to improve knowledge management and key business results through the EFQM excellence model. International Journal of Project Management, 33(8), pp. 16381651. Cammann, C., Fichman, M., Jenkins, G.D. & Klesh, J. 1983. Michigan Organizational Assessment Questionnaire. Assessing Organizational Change: A Guide To Methods, Measures, and Practices, pp. 71–138. Carlson, K. D. & Wu, J. 2012. The illusion of statistical control: Control variable practice in management research. Organizational Research Methods, 15, pp. 413–435. Davenport, T.H. & Prusak, L. 1998. Working knowledge: how organizations manage what they know, Boston, MA. Davis, K. 1988. Human behaviour at work: organizational behaviour, McGraw-Hill, New York. De Long, D.W. & Fahey, L. 2000. Diagnosing Cultural Barriers to Knowledge Management. Academy of Management Executive, 14(4), pp. 113-127. Eskildsen, J., Kristensen, K. & Antvor, H.G. 2010. The relationship between job satisfaction and national culture. The TQM Journal, 22(4), pp. 369-378. Fornell, C. & Larcker, D.F. 1981. Evaluating structural equation models with unobservable variables and measurement error. Journal of Marketing Research, 18(1), pp. 39-50. Ford, D.P. & Chan, Y.E. 2003. Knowledge sharing in multi-cultural setting: a case study. Knowledge Management Research and Practice, 1(1), pp. 11-27. Francis, G. 2001. Introduction to SPSS for Windows (3rd ed.). Sydney, NSW: Pearson Education. Gemino, A., Reich, B.H. & Sauer, C. (2015), “Plans versus people: Comparing knowledge management approaches in ITenabled business projects”, International Journal of Project Management, 33(2), pp. 299-310. Hair, J. F., Anderson, R. E., Babin, B. J. & Black, W. C. 2010. Multivariate data analysis: A global perspective. Upper Saddle River, NJ: Pearson. Habib, S., Aslam, S., Hussain, A., Yasmeen, S. & Ibrahim, M. 2014. The Impact of Organizational Culture on Job Satisfaction, Employees Commitment and Turn over Intention. Advances in Economics and Business, 2, pp. 215-222. He, W. & Wei, K.-K. 2009. What Drives Continued Knowledge Sharing? An Investigation of Knowledge- Contribution and Seeking Beliefs, Decision Support Systems, 46(4), pp. 826-838. Hofstede, G. 1980. Culture’s consequences: international differences in work-related values, Sage: Beverly Hills, CA. Hofstede, G. 2001. Culture’s consequences: comparing values, behaviors, institutions and organizations across nations, Sage Publications, Thousand Oaks, CA. Hofstede, G., Hofstede, G.J. & Minkov, M. 2010. Cultures and Organisations: Software of the Mind. 3rd Edition, McGrawHill USA. House, R.J., Hanges, P.J. & Javidan, M. 2004. Culture, Leaderships and Organizations: The Globe Study of 62 Societes, SAGE Publications, London. Husain, S.N. & Husain, Y.S. 2016. Mediating Effect of OCB on Relationship between Job Attitudes and Knowledge Sharing Behavior. International Journal of Science and Research, 5(1), pp. 1008-1015. Idris, S., Wahab, R. & Jaapar, A. 2015. Corporate cultures integration and organizational performance: A conceptual model on the performance of acquiring companies. Procedia - Social and Behavioral Sciences, 172, pp. 591-595. Kathiravelu, S.R., Mansor, N.N.A., Ramayah, T. & Idris, N. 2014. Why Organisational Culture Drives Knowledge Sharing? Procedia-Social and Behavioral Sciences, 129, pp. 119-126. Kesterson R.K. 2015. The Basics of Hoshin Kanri, CRC Press, Taylor & Francis, NY. Kianto, A., Vanhala, M. & Heilmann, P. 2016. The impact of knowledge management on job satisfaction, Journal of Knowledge Management, 20(4), pp. 621-636. Kirkman, B.L & Shapiro, D.L. 2001. The impact of cultural values on job satisfaction and organizational commitment in selfmanaging work teams: The mediating role of employee resistance. The Academy of Management Journal, 44(3), pp. 557-569. Kish, L. 1959. Some statistical problems in research design, American Sociological Review, 24(3), pp. 328–338. Kotter, J.P. 2008. Corporate culture and performance, Simon and Schuster. Kucharska, W. & Kowalczyk, R. 2018. How to achieve sustainability?—Employee's point of view on company's culture and CSR practice, Corporate Social Responsibility and Environmental Management, 26(2), pp. 453-467 https://doi.org/10.1002/csr.1696 Kucharska, W., Wildowicz-Giegiel, A. & Bedford, D.A.D. 2018. The Mediation Function of Job Satisfaction’s between Organizational Culture Dimensions and Knowledge Sharing, in: Bolisani E., Di Maria, E., Scarso, E. (Eds), Proceedings of the 19th European Conference of Knowledge Management, 1, pp. 430-438. Kucharska, W. & Wildowicz-Giegiel, A. 2017. Company Culture, Knowledge Sharing and Organizational Performance. The Employee’s Perspective. Proceedings of the 18th European Conference on Knowledge Management, 1, pp. 524-531. Lai, M. & Lee, G.G. 2007. Risk-avoiding cultures towards the achievement of knowledge sharing, Business Process Management Journal, 13(4), pp. 522-527. Lee, J. & Gaur, A. 2013. Managing multi-business firms: A comparison between Korean Chaebols and diversified U.S. firms. Journal of World Business, 48, pp. 443-454. Lin, H.-E., McDonough, E., Lin, S.J. & Lin, C. 2013. Managing the exploitation/exploration paradox: The role of a learning capability and innovation ambidexterity. Journal of Product Innovation Management, 30(2), pp. 262-278. Lin, Y. & Dalkir, K. 2010. Factors affecting KM implementation in the Chinese community. International Journal m of Knowledge Management, 6(1), pp. 1-22. Ling-Hsing, Ch. & Lin, T.Ch. 2015. The role of organizational culture in the knowledge management process”, Journal of Knowledge Management, 9(3), pp. 433-455. Liu, Y., Chan, Ch., Zhao, Ch. & Liu, Ch. 2018. 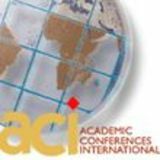 Unpacking knowledge management practices in China: do institution, national and organizational culture matter? Journal of Knowledge Management, https://doi.org/10.1108/ JKM-07-2017-0260. Locke, E.A. 1976. The nature and causes of job satisfaction, in Dunnette (ed. ), Handbook of industrial and organizational psychology, Rand McNally, Chicago. Lok, P. & Crawford, J. 2001. Antecedents of organizational commitment and the mediating role of job satisfaction. Journal of Managerial Psychology, 16(8), pp. 594-613. Lund, D.B. 2003. Organizational culture and job satisfaction. Journal of Business & Industrial Marketing, 18(3), pp. 219-236. Ma, Z., Huang, Y., Wu, J., Dong,W. & Qi, L. 2014. What matters for knowledge sharing in collectivistic cultures? Empirical evidence from China. Journal of Knowledge Management, 18(5), pp. 1004-1019. McDonald, R. P. & Marsh, H. W. 1990. Choosing a multivariate model: Noncentrality and goodness of fit. Psychological Bulletin, 107(2), 247–255. Mc Manus, P., Ragab, M., Arisha, A. & Mulhall, S. 2016. Review of Factors Influencing Employees’ Willingness to Share Knowledge, Proceedings of the 18th European Conference on Knowledge Management (ECKM), Belfast, Northern Ireland. Mesmer-Magnus, J.R. & DeChurch, L.A. 2009. Information sharing and team performance: A meta-analysis. Journal of Applied Psychology, 94, pp. 535–546. Mládková, L., Zouharová, J. & Nový, J. 2015. Motivation and Knowledge Workers. Procedia-Social and Behavioral Sciences, 207, pp. 768-776. Mueller, J. 2014. A specific knowledge culture: Cultural antecedents for knowledge sharing between project teams. European Management Journal, 32(2), pp. 190-202. Muller, J. C.-Y. 2018. Effective Knowledge Management and Organisational Learning in the Context of Sustainable Development, Electronic Journal of Knowledge Management, 16(1), pp. 56-69. Nielsen, B.B. & Raswant, A. 2018. The selection, use, and reporting of control variables in international business research: A review and recommendations. Journal of World Business. https://doi.org/10.1016/j.jwb.2018.05.003 Pangil, F. & Moi Chan, J. 2014. The mediating effect of knowledge sharing on the relationship between trust and virtual team effectiveness. Journal of Knowledge Management, 18, pp. 92-106. Park, J.G. & Lee, J. 2014. Knowledge sharing in information systems development projects: Explicating the role of dependence and trust. International Journal of Project Management, 32(1), pp. 153-165. Pérez-López, S. & Alegre, J. 2012. Information technology competency, knowledge processes and firm performance. Industrial Management & Data Systems, 112(4), pp. 644-662. Pinjani, P. & Palvia, P. 2013. Trust and Knowledge Sharing in Diverse Global Virtual Teams. Information & Management, 50, pp. 144-153. Rafique, G.M. & Mahmood, K. 2018. Relationship between knowledge sharing and job satisfaction: a systematic review. Information and Learning Science, 119(5/6), pp. 295-312. Rehman, M., Mahmood, A.K., Salleh, R. & Amin, A. 2014. Job satisfaction and knowledge sharing among computer and information science faculty members: a case of Malaysian universities. Research Journal of Applied Sciences, Engineering and Technology, 7(4), pp. 839-848. Rezaei, G., Gholami, H., Shaharou, A.B. M., Saman, M.Z.M., Zakuan, N. & Najmi, M. 2016. Relationship among culture of excellence, organisational performance and knowledge sharing: proposed conceptual framework. International Journal of Productivity and Quality Management, 19(4), pp. 446-465. Rikowski, R. (Ed.). 2007. Knowledge management: Social, cultural and theoretical perspectives. Elsevier. Rivera-Vazquez, J.C., Ortiz-Fournier, L.V. & Flores, F.R. 2009. Overcoming cultural barriers for innovation and knowledge sharing. Journal of Knowledge Management, 13(5), pp. 257-270. Saeed, M.S. 2016. The Impact of Job Satisfaction on Knowledge Sharing on Employee Performance. Journal of Resources Development and Management, 21, pp. 16-23. Santoro, G., Vrontis, D., Thrassou A. & Dezi L. 2018. The Internet of Things: Building a knowledge management system for open innovation and knowledge management capacity. Technological Forecasting & Social Change, http://dx.doi.org/10.1016/j.techfore.2017.02.034 Schein, E.H. 1986. Organizational Culture and Leadership, Jossey-Bass, San Francisco. Senge, P., Kleiner, A. Roberts, Ch., Ross, R.B. & Smith, B.J. 2014. Strategies and Tools for Building a Learning Organization, Crown Business. Spector, P.E. 1997. Job satisfaction: application, assessment, cause, and consequences, Sage Publications, Thousand Oaks, CA. Springer, A.J. 2001. A study of job motivation, satisfaction, and performance among bank employees. Journal of Global Business Issues, 5(1), pp. 29-43. Steiger, J.H. & Lind, J.C. 1980. Statistically based tests for the number of common factors. Annual meeting of the Psychometric Society, Iowa City, IA, 758. Suliman, A. & Al-Hosani A.A. 2014. Job satisfaction and knowledge sharing: The case of the UAE. Issues in Business Management and Economics, 2(2), pp. 024-033. Sundaresan, S. & Zhang, Z. 2013. Knowledge Sharing and the Dynamic Evolution of Organizational Culture: Impact of Incentives and Information Technology. Northeast Decision Sciences Institute Annual Meeting Proceedings, pp. 617624. Suppiah, V. & Sandhu, M.S. 2011. Organisational Culture’s Influence on Tacit Knowledge Sharing Behaviour, Journal of Knowledge Management, 15(3), pp. 462–477. Thongprasert, N. & Cross, J.M. 2008. Cross-Cultural Perspectives of Knowledge Sharing for Different Virtual Classroom Environments: A Case Study of Thai Students in Thai and Australian Universities, Proceedings of EDU COM 2008 International Conference. Sustainability in Higher Education: Direction for Change, Cowan University, Perth, pp. 514523. Ting-Toomey, S. 2012. Communicating across cultures. Guilford Press. Tong, C., Tak, W.I.W. & Wong, A. 2014. The Impact of knowledge sharing on the relationship between organizational culture and Job satisfaction: The perception of information communication and technology (ICT) practitioners in Hong Kong. International Journal of Human Resource Studies, 5(1), pp. 19-47. Trompenaars, F. & Hampden-Turner, Ch. 2002. Seven dimensions of culture, Oficyna Ekonomiczna, Kraków. Tsai W. & Ghoshal S. 1998. Social capital and value creation: The role of intra firm networks. Academy of Management Journal, 41, pp. 464-476. Warr, P. 2007. Searching for happiness at work. The Psychologist, 20, pp. 726-729. Wheaton, D.E. 1977. Assessing reliability and stability in panel models. Sociological Methodology, San Francisco: JosseyBass. Wilkesmann, U., Fischer, H. & Wilkesmann, R. 2009. Cultural characteristics of knowledge transfer. Journal of Knowledge Management, 13(6), pp. 464-477. Witherspoon, L.C., Jason, B., Cam, C. & Dan, S.N. 2013. Antecedents of business knowledge sharing: a meta-analysis and critique. Journal of Knowledge Management, 17(2), pp. 250-277. Wu, C.-C., Liu, Y.-C., Lin, Y.-T. & Chou, C.-H. 2013. The empirical study of job satisfaction and knowledge sharing-based on two-factor motivation theory. Business and Information, pp. 368-382. Yan, Y. & Davison, R.M. 2013. Exploring Behavioral Transfer from Knowledge Seeking to Knowledge Contributing: The Mediating Role of Intrinsic Motivation. Journal of the American Society for Information Science and Technology, 64(6), pp. 1144-1157. Yoo, B., Donthu, N. & Lenartowicz, T. 2011. Measuring Hofstede's five dimensions of cultural values at the individual level: Development and validation of CVSCALE. Journal of International Consumer Marketing, 23(3-4), pp. 193-210. Young. T. & Milton, N. 2011. Knowledge Management for Sales and Marketing, CP Chandos Publishing. Zieba, M., Bolisani, E. & Scarso, E. 2016. Emergent approach to knowledge management by small companies: multiple casestudy research. Journal of Knowledge Management, 20(2), pp. 292-307. P1- Head Office was satisfied with company’s annual results P2- Head Office was satisfied with the company’s benefits P3- Head Office assessed the company’s annual results positively P4- My boss was satisfied with my results P5- Department’s boss assessed the department’s results positively S1-I am satisfied with my job S2-I have a good job S3-I like my job KS1-The company has formal mechanisms to guarantee the sharing of best practices among the different fields of the activity KS2-I shared my experience and know-how with my co-workers KS3-I extracted new knowledge from coworkers based on their experience and knowhow that helped me follow up. KS4-Overall, members of the company shared their experience and know-how. Masculinity (M): MA1-It’s more important for men to have a professional career than it’s for women. MA2-Men usually solve problem with logical analysis while women with intuition. MA3-Solving difficult problems usually requires an active, forcible approach, which is typical for men. Power Distance (PD): PO1-People in higher position make most decisions without consulting people in lower positions. PO2-People in higher positions not ask of the opinions of people in lower positions too frequently. PO3-People in higher positions avoid social interaction with people in in lower position. Uncertainty Avoidance (U): UN1 -It’s important to closely follow instructions and procedures. UN2 -Rules and regulations are important because they inform me of what is expected of me. UN3-Standarized work procedures are helpful. Long-Term Orientation (L): L1-Going on resolutely in spite of opposition is visible L2- Long term planning is noticeable. L3-People are working hard for success in the future Collectivism (C): C1- Individuals sacrifice self-interest for the group C2-Group welfare is more important than individual success. C3- Group success is more important than individual success. Knowledge Sharing and Organizational Culture Dimensions: Does Job Satisfaction Matter?